The "new" bridge, although I think that it's been here for at least 40 years. It is up river from the old bridge, which is just out of picture, to the right. "Pont Maentwrog has three elliptical arches with triple keystones, each part consisting of three thin stones. This feature also appears in Pont Rhyd Lanfair over the Conwy, which was built in 1780, and it is probable that Pont Maentwrog was built about the same date." 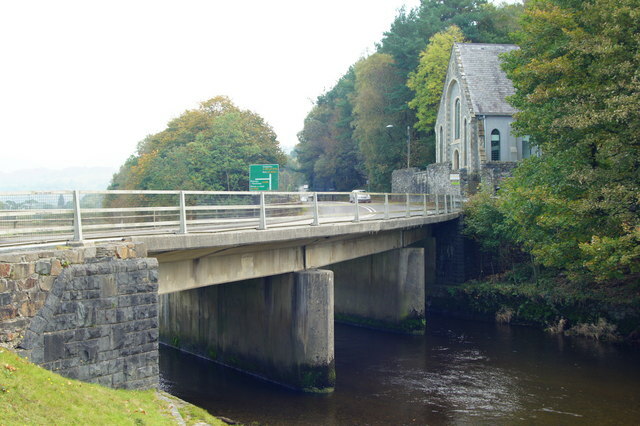 Gwyndaf Breese also remarks on the similarity in style to Pont-Llan at Penmachno, built in 1785.